Description: – Measure the space you have and figure out what size of cabinets to use and how to lay them out. I used 9 Faktum cabinets in total: 4 x 80 cm wide, 1 x 60 cm wide (total width of the space was only 230 cm) and 4 x 40 cm wide, layed out as in the picture. – Assemble all the full height cabinets. Leave the backing off one of the big ones – this will be the doorway to the storage space. – Lay out the cabinets. Optionally lay cabinets on a lumber footing, so they’re easier to open. This also helps to attach the cabinets: you can screw them on the footing. – Attach cabinets to each other and build an inner structure to reinforce them and to take the most of the weight of the bed and anyone laying on it. – Optionally cover the tops of cabinets with plywood (or other material) for a sleeker look. Treat your chosen material (I waxed the plywood after sanding it fine) so it’s easier to clean and will keep looking nice. – Attach the bed on top of the structure. I used steel brackets (used them on a lot of places in the construction as well). – Attach doors and handles. Line up the doors. – Step back and enjoy! And then fill it up. There’s more photos in my blog. What would you say a cost estimate would be to crate this? I LOVE this bed. I have a fairly small room and I’m wondering what the dimensions of this bed are. 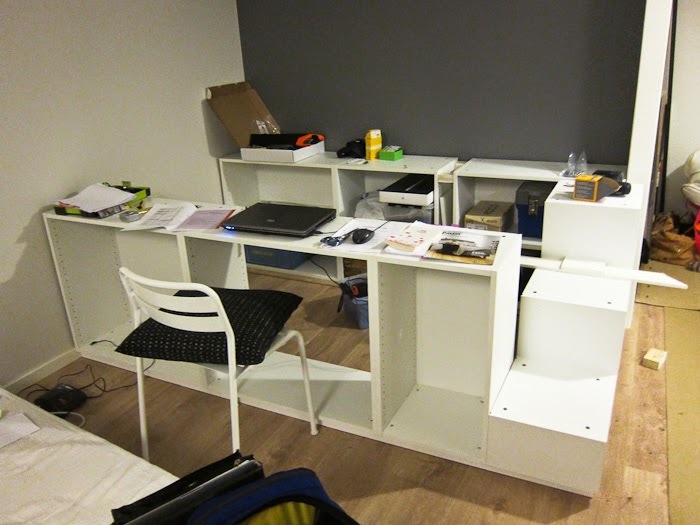 I would also like to know a brand name of cabinets like the ones that were posted because Ikea no longer sells them. I had no idea that I can make such a bed by myself! It looks so nice and tidy because there is a place where I can put the sheets for example. Thanks a lot for sharing! Regards! 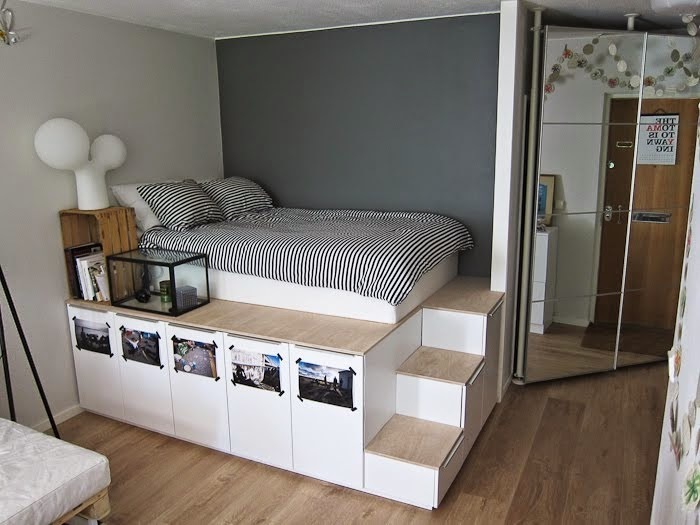 Thanks for posting this, it’s exactly the kind of platform bed I was looking for.